LÆRDAL (Panorama): Tuesday last week, ESN organised a trip to Lærdal, located in the UNESCO listed scenery in the deepest fjord of Norway, Sognefjorden. «The biggest event of ESN Norway!» Ahmed Abdulbakir, national coordinator of the event and university student at HiMolde, started planning the event back in March, together with other Erasmus Student Network (ESN) sections, in order to make this experience as unique as possible for the university students. The event had not even started yet, and the students already got their first part of adventure. Issues on the road resulted in delay for of a couple of hours, making the trip pretty adventurous from the start! The first thing on the agenda was a tour through the city of Bergen. Bergen, as most of you probably know, is not only the second largest city in Norway, but is also known for it’s all year round presence of «liquid sunshine». Nonetheless the students were able to visit the fish market, Bryggen the old German merchants town, Bergenhus festning and several more particularities of the city. Thereafter, it was time to head to Lærdal. As with most things in Norway, it’s never just a ride. Driving through Lærdal tunnel, the longest tunnel in the world, 24.6km, together with well thought-off jokes from the ESN members, it did not seem to take long to get to our next stop, the camping site. Rise and shine, Thursday was the first day of activities in the surroundings of Lærdal. Having slept in cabins, hostel rooms or apartments, all of the 330 student attending the event were ready for the day. At 0800 sharp the bus left for the first stop of the day, Borgund Stavkyrkje. The Borgund Stave Church is the most authentic one of all 28 extant stave churches in Norway. Originally build in 1181, it’s surrounded by years and years of change and evolution, yet remaining in the authenticity and beauty of its environment. Afterwards they continued the trip to Gudvangen, one of the places where it is possible to start a sightseeing cruise on the Sognefjord. Sognefjord is not only the longest and deepest fjord, the mountains surrounding it are among the most majestic in Norway! Arriving with the boat at Flåm, students had the choice of taking the unique Flåm train, having another perspective on the fjord, or staying in the village, enjoying some freshly made local fish soup, amongst other things to do. 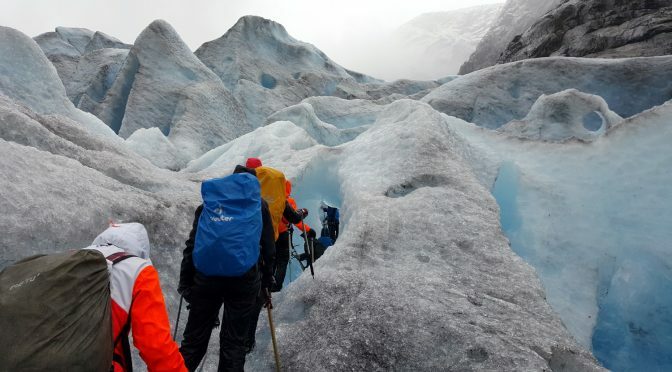 Day four, Friday, was probably the day most students had been waiting for, the glacier hike. Driving to Nigardsbreen glacier there was a sense of uncertainty of what to expect. Arriving at the bottom of the mountain, just before the commencement of a 1.5 hour hike to the starting point of the glacier, it still did not occur to most what they were heading towards. Misty mountains and lots of rain were also part of the play that day. Yet, it didn’t diminish at all the impression of the glacier itself. «One of the most impressive works of nature I’ve ever seen in my entire life!» is one of the expressions that came to several students minds. Constantly changing blue ice landscapes together with the eternal presence of the glacier. It was a once in a lifetime activity for them to experience. ESN members did their best, as always, to treat everybody as good as possible, providing ice breaker activities during the evening for students to expand their circle of friends and to enjoy their time to the fullest! Listening to the reactions of several students, it would be fair to say that it was an adventurous trip indeed, and definitely one to recommend for others to do!